Bolar is an Orc mage and wise woman of Narzulbur, the Orc stronghold of Eastmarch. 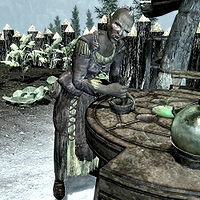 She offers apothecary services from 8am to 8pm, not far from the longhouse of the stronghold. After 8pm she heads back inside to eat until midnight. As wise woman of the Narzulbur tribe, Bolar is counted upon by the chieftain to communicate with the gods to figure out why all his wives have died. "I've read the entrails many times, but can't find the reason why Mauhulakh's wives keep finding tragedy." She's not in any rush though, because as far as she's concerned, as long as he has Yatul and herself, he doesn't need anyone else. She thinks he's showing signs of weakness by being sentimental over their deaths. "Mauhulakh was such a darling boy. Until he got older, and started having opinions." She raised his children, Urog and Dushnamub, after each of their mothers died during childbirth while she was the midwife. "Urog and Dushnamub were such lovely children. I held them as they watched their mothers die after birth. They know me best, now." A grown Dushnamub now seems to find that suspicious, especially with they way she treats his father. "Yatul and I tend to dote on Mauhulakh. You know how aunts can be with their favorite nephew." This is the merchandise found in Bolar's merchant chest. These items are only available if purchased from the merchant; they cannot be pickpocketed or stolen. They are restocked every two days. This page was last modified on 10 April 2013, at 02:53.